I'd post this in Life, but this is where all the cool kids hang out! We had sirloin steak, corn, mushrooms and grilled asparagus. Hamburger patty. Handful of peanuts. How do you grill asparagus? Well, for us it's a personal taste, about 4-5 minutes when everything else is done. Oh yes, gotta have wine with Sunday dinner . Yeah. Raining off and on here. Thanks for posting this OP. Steak and Ale pie covered in swiss cheese, green beans on the side. 1. Hamburger patty. Handful of peanuts. In honor of Omar and the other Muslim feckless cunts that are crying right now. I will also have Bacon, Ham, and eggs tomorrow morning and every day for breakfast this week. Ending with a Giant Ham dinner on Sunday. 13. Grilled rib eye ! Nix on the tater tots....haven't eaten them since college. But I'm just not feeling that ambitous. I can grill up a mouth watering rib eye though. 5. How do you grill asparagus? I have never found a way to prepare it well. FWIW, please don't post such things in politics. It's just not right. 7. Well, for us it's a personal taste, about 4-5 minutes when everything else is done. A little bit of oil and salt/pepper or other seasoning to taste. Weber's Garlic/Herb seasoning does well. of beef , pork and homemade meatballs....simmered for 6 hours ) with freshly grated Parmigiano- Reggiano cheese. We call it the " Mafia Dinner ". Lefty and righty CAN get along. Same dinner tonight! Plus a glass of Cabernet Sauvignon. 15. Oh yes, gotta have wine with Sunday dinner . The weather was awful last night and I'm tired..
11. Yeah. Raining off and on here. We managed to get the car show at church done yesterday. Good weather, not too hot. Cut my grass (weeds) Friday, thank goodness. Wasn't feeling it yesterday and was not an option today. The Missus and I did get our evening walk in before the rain started back. yesterday. We have about an acre to mow. and yesterday, it was rainy off and on and windy. I stayed up until midnight watching the weather, but fell asleep. tornado warning at 3 am. Went back to sleep around 4ish. Had to get up at 7 to get ready for church and study my bible lesson for sunday school. 16. Thanks for posting this OP. I'm a foodie and always enjoy seeing what other people are cooking. 21. That oughta be illegal! 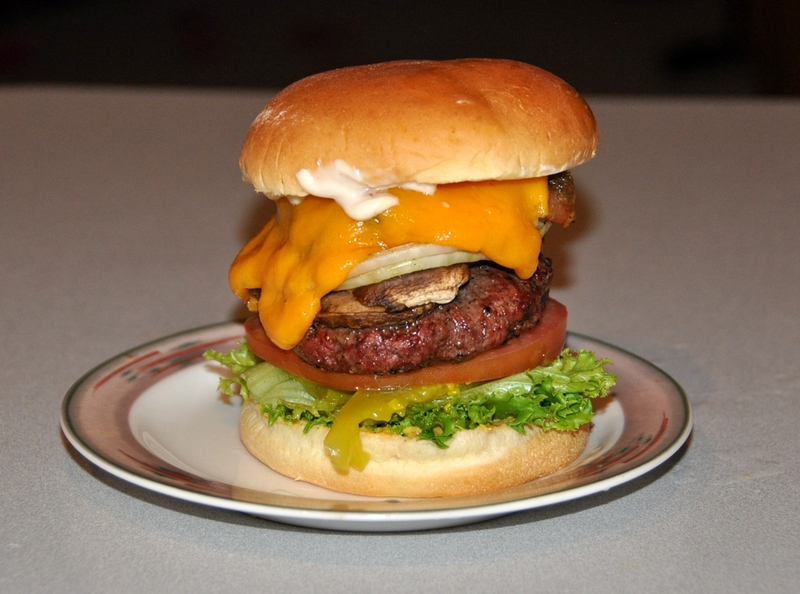 I was a bachelor for last night and pan fried a burger w/ onions and mushrooms, cheddar cheese. Didn't look anything like that, but it was tasty. Microwaved a potato as well. 22. Steak and Ale pie covered in swiss cheese, green beans on the side.